Welcome to our full On-line Product Website. We at Sierra Electronics have always strived to bring you our valued customers the best in customer service, high quality product and very competitive pricing. A brief tour through our website will show you an extensive list of Semiconductors, a wide range of Flybacks, an expanded list of Optical CD Pickup Heads, Tuners, Capacitors and our newest line of Audio & Video Accessories and related products. 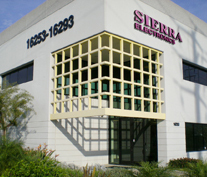 Today Sierra Electronics has the broadest line of Semiconductors in the Audio and Video industry and have earned the distinction of being the leader in this industry, thanks to you our valued customers and thanks to 20 years of support and hope that we can continue to be of service to you for all your Electronic Component needs.